Charlotte (CNN) – Clint Eastwood meet Scarlett Johansson, Natalie Portman and Kerry Washington. The three actresses, firmly anchored in Hollywood's royalty, have been secretly scheduled to speak at the Democratic National Convention, according to a tentative schedule provided by a source to CNN. The schedule lists the three actresses as speaking on Thursday evening, the same night that President Obama and Vice President Joe Biden will accept their party's respective nominations. Johansson, Portman and Washington are listed as following The Foo Fighters on the itinerary. Convention officials announced that the alternative rock band would perform last week. A source told CNN the hope is to have the three actresses appear on stage together. It's unclear if the schedule has been finalized or is subject to change. When contacted by CNN, a DNC official said that no final details about the Thursday program would be divulged at this time. CNN reached out to representatives for each actress but did not receive comment for Johansson and Portman. A representative for Washington would only say the actress is currently filming in Los Angeles. Though several celebrities are slated to attend the DNC, appearances by Johansson, Portman and Washington would surely invite special political scrutiny. 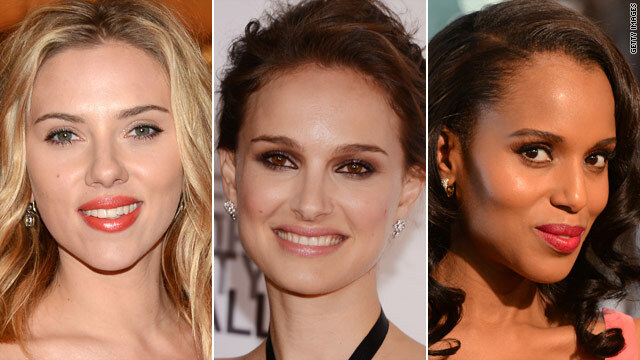 All three are popular, award-winning actresses and among Hollywood's most bankable stars. But perhaps more importantly, all three represent demographics that Democrats hope to win by wide margins: women and young voters. Johansson is 27 years old, Portman is 31 and Washington is 35. Should the actresses take the stage supporting the president it could help Democrats present a picture of inclusiveness and diversity within the party. Johansson and Portman are white, Washington is African-American. Meanwhile, an appearance by the trio would come one week after another political surprise move by a Hollywood royal. Clint Eastwood delivered an unannounced speech at the Republican National Convention on Romney's behalf on Thursday. Though it was well received by conservatives in attendance and others watching at home – Eastwood's speech, where he had a conversation with an imaginary President Obama represented by an empty chair, was mocked by many others. One thing Eastwood has in common with the women: they are all critically acclaimed actors. In addition to positive reviews in other films, Portman won an Academy Award in 2011 for her role in "The Black Swan." Johansson has seen critical acclaim for roles in films such as "Lost in Translation," "A Love Song for Bobby Long" and "The Other Boleyn Girl." Washington currently stars in ABC's hit show "Scandal" and roundly received praise for her roles in the films "For Colored Girls," "The Last King of Scotland" and the Ray Charles biopic, "Ray." Johansson, Portman and Washington were vocal supporters of Obama in 2008.